If you are making measurements in the field, the Agilent N9342C handheld spectrum analyzer (HSA) makes your job easier. MIL PRF 28800 Class 2 compliant, it has the features you need for operating in tough field environments and its measurement performance gives you confidence the job's been done right. The N9342C HSA lets you automate routine tasks to save time and ensure consistent results. 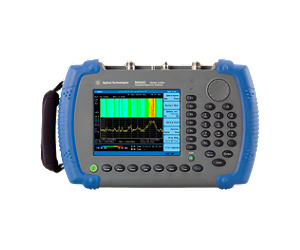 Field testing just got easier with the Agilent N9342C HSA.